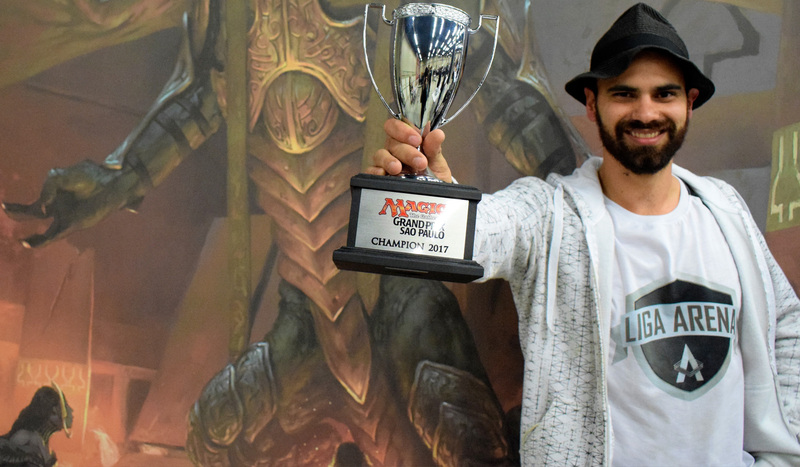 Congratulations to Joao Lelis, your Grand Prix São Paulo 2017 Champion! THE HASHTAG FOR GRAND PRIX São Paulo IS #GPSPAULO. JOIN THE CONVERSATION. Exactly 1,200 players from around the region converged at São Paulo, each hoping to be crowned a Grand Prix Champion. By nightfall, local hero Joao Lelis hoisted the trophy, keeping the title on Brazilian soil. Piloting Bant Knightfall, he first defeated Julian Reyes in the quarterfinals before dispatching Rafael Costa Zaghi in the semifinals. Then, Lelis faced off against Vitor Grassato’s Titan Shift deck, a matchup he did not like very much. Despite that, he was able to secure the victory in two swift games. 25-ranked Carlos Romao could have been dropped from the rankings but his Top 8 performance this weekend took care of that little issue. Making his tenth lifetime Grand Prix Top 8, he was the hot favourite to win it all, but fell in the quarterfinals in three tight games. Rounding off the rest of the Top 8 were semifinalist Danilo Ramos Mopesto and quarterfinals Jean Sato and Fabian Nunez, happy to be qualified for Pro Tour Ixalan in Albuquerque. Once again, hearty congratulations to Joao Lelil, your Grand Prix São Paulo 2017 Champion! Of the 1200 players, only three survived Day One with the perfect 9-0 record, namely Guilherme Lundgren, Danilo Ramos Mopesto, and Carlos Alexandre dos Santos Esteves. 329 made the Day Two cut and six more rounds of Modern Constructed will take place tomorrow. At 8-1, the most notable names are former World Champion (25) Carlos Romão, (22) Thiago Saporito, Jonathan Melamed, Marcos Paulo De Jesus Freitas. (1) Paulo Vitor Damo da Rosa holds the highest tiebreakers for everyone at 7-2, a record which was also achieved by vetarans Vagner Casatti and Pedro Carvalho among others. The double Modern Grand Prix weekend is just about to heat up! Stay around to witness the crowning of two more Grand Prix Champions, one in Birmingham and of course one here in São Paulo!